Each box contains two Spartan Eradicators. Together the two eradicators will protect up to one acre. Installation is simple. There will be a significant drop in the mosquito population within the first 15 days. Spartan Mosquito Eradicators protect your property for up to 90 days. Help protect yourself from mosquito bites. 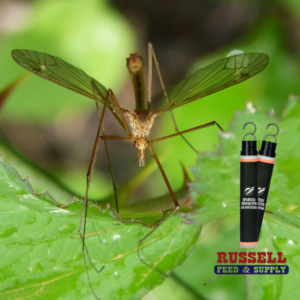 Invest in Spartan Mosquito Eradicators from Russell Feed and Supply and take back your outdoors the Spartan way! This entry was posted on Thursday, March 14th, 2019 at 4:33 pm	and is filed under Insect Control, News & Updates. You can follow any responses to this entry through the RSS 2.0 feed. Both comments and pings are currently closed.